As I mentioned on the About page, one of the things I’m interested in in writing this blog is not only tracking the development of these new technologies themselves but also looking at their impact on the economy as a whole, because for my money that’s where things really start to get interesting. So I wanted to use this note to talk about something that I’m sure will come up again and again: The productivity paradox. In the economy as a whole, then, if smart machines were taking over for labor, we might see greater unemployment. But we should also see increasing productivity, as fewer and fewer workers could produce the same amount of economically valuable stuff. Even though bots these days are wandering pretty far from the factory floor, manufacturing is still the sector of the economy which has the most experience in integrating robots and automation, and if we were going to see huge productivity increases from the adaption of these technologies in the past half-decade or so, you’d think we’d see it there first. But no soap. Compared to the 1990s, back when the internet was getting invented and Excel was taking over, the gains in productivity in recent years have been much lower. 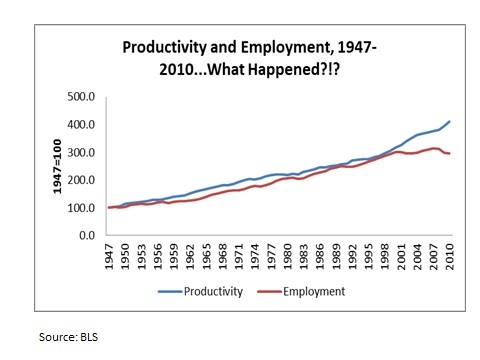 Even worse, while historically gains in productivity have marched step by step with gains for workers, over the past couple decades we’ve seen these two factors begin to split apart, with productivity marching on (albeit slower than in the past), while wages and employment have stayed stuck. There’s a bunch of competing explanations out there for this phenomena, some of which kind of fit together, some of which don’t: Robert Gordon has suggested that as cool as iPhones and Facebook are and whatnot, they’re not as actually useful to the economy as say, cars, or jet planes, or hell, indoor plumbing and electricity, and so maybe the economy is just doomed to grow a lot slower for the forseeable future. Larry Summers of Harvard has advanced the idea of “secular stagnation” — which suggests* that maybe companies just aren’t seeing many new widget machines out there to buy than can give them a 10% improvement to their assembly lines, and so they’re hoarding their money (or worse, investing it in shaky schemes which help create bubbles), and the government can’t do much to make them spend it. One of the other explanations for the persistently sluggish economy of the past several years and stuff like the productivity paradox and the decoupling of productivity and employment is that, uh, maybe economists just don’t understand the macroeconomy as well as they thought they did. And so they’re going to have a hell of a time figuring out what the impact of truly revolutionary technologies will be. In part, it’s a lot more complicated than all this. For a really full discussion — book length, in fact — of secular stagnation and what might be causing it, see here. Next Next post: Can’t Humans And Robots Just Get Along? An Interview with Prof. James E. Young.